As part of Rev. 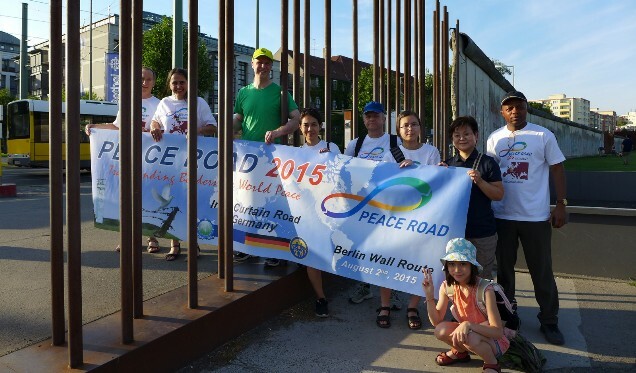 and Mrs. Sun Myung Moons International Peace Road 2015 initiative and part of the Peace Road in Germany we went on a bicycle tour in Berlin, travelling along the route and places that remember the existence of the Berlin Wall - the iconic symbol of the cold war era and the manifestation of division between two ideological camps. Now, 26 years after this wall has come down, its remainders are still a big magnet for millions of tourists every year. The Berlin Wall has been a symbol of division. But the wall that was overcome, the wall that doesn´t exist anymore has become a symbol of joy and hope and a symbol, that even the most strongly guarded borders can open up peacefully. While cycling and visiting the various historic places in Berlin we prayed for the re-unification of Korea and for a heartistically united human family - connected through roads of peace.